Traders across Syria reported widely fluctuating rates and two currency dealers in Damascus, where the pound appeared to be hit hardest, said it fell below 200 to the dollar for the first time in what one described as panic buying of the U.S. currency. On Monday evening the pound traded at 205 to the dollar, down 20 percent in four days and 77 percent down since the start of the anti-Assad uprising in March 2011 when it was at 47. The idea of examining currency prices over the course of a conflict is interesting. 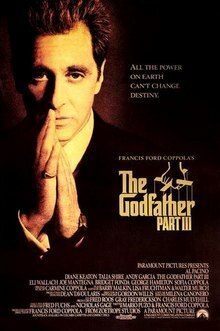 There are a number of confounders of course. For instance, the regime can often intervene in certain ways to affect the value of currency. Other incidents besides the conflict itself can also drive currency fluctuations, especially when the conflict is relatively minor. One nice case (from strictly a research perspective) is the US Civil War, when both the Union and Confederacy issued their own notes. Jeffrey Arnold‘s project, “Pricing the Costly Lottery: Financial Market Reactions to Battleﬁeld Events in the American Civil War,” leverages this fact to see how markets responded to successes and failures of either side. We discussed this project before when it was presented as a poster at PolMeth 2012, and Jeffrey’s website now has his MPSA 2013 slides. What role does combat play in resolving the disagreement that initiated war? Bargaining theories of war propose two mechanisms, the destruction of capabilities and the revelation of private information. These mechanisms are difficult to analyze quantitatively because the mechanisms are observationally equivalent, the participants’ expectations are unobservable, and there is a lack of data on battles. With new methods and new data on the American Civil War, I address these challenges. I estimate the information revealed by combat with a model of Bayesian learning. I use prices of Union and Cnnnonfederate currencies to measure public expectations of war duration and outcome. Data on battlefield events come from detailed data on the outcomes and casualties of the battles of the American Civil War. The results suggest that battle outcomes rather than casualties or information revelation had the largest influence on the expected duration of the American Civil War. Wardlab is the working group run by Michael D. Ward. The lab has a new website: mdwardlab.com. You can find out about our ongoing projects, download software packages, or follow the Conflict Forecast blog. The team includes some really smart people, several of whom have their own websites. The site is still in a beta version, but many in this blog’s audience are interested in political forecasting and conflict, so I thought I would go ahead and share. This blog has discussed conflict statistics before, as well as some of the widely acknowledged problems with adapting “physics models” to the social sciences. To provide some context to that debate, I thought I would share an example that I recently came across. The example I present here is interesting for its historical relevance, and is not put forth as a prototype for the kind of work that political scientists ought to be doing. The model is F.W. Lanchester’s Square Law for Modern Combat, and it comes to us by way of Martin Braun’s Differential Equations and Their Applications. 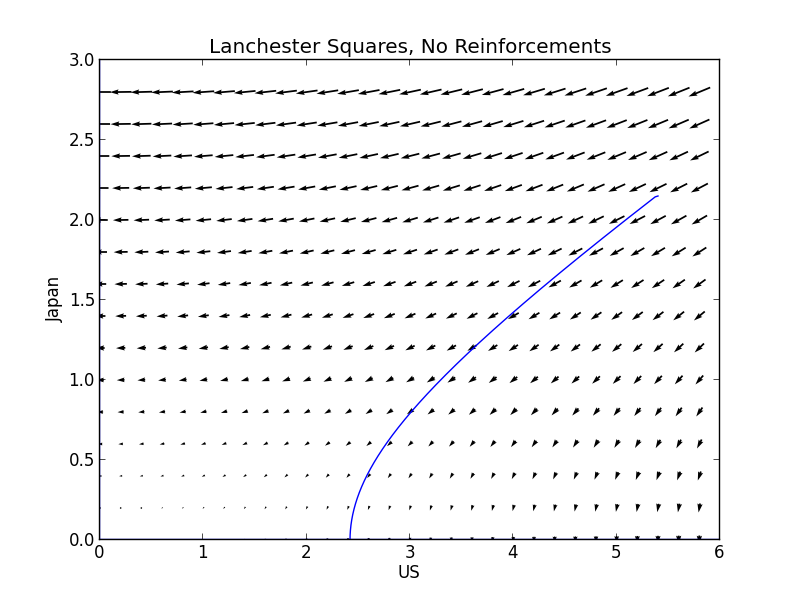 Lanchester’s model describes the rate at which casualties will occur in a two-sided battle with modern weapons, and takes its name from the idea that the power of each side is proportional to the square of its size. Rather than modeling when international conflicts will occur, as many modern scholars do, the model is intended to predict which side will win a battle. Suppose that two armies, Red and Blue, are engaging each other in combat. Red is firing a continuous stream of bullets at Blue. Meanwhile, Blue is firing a continuous stream of bullets at Red. Let symbol y represent the number of soldiers in the Red force at the beginning of the battle. Each one has offensive firepower α, which is the number of enemy soldiers it can knock out of battle (e.g., kill or incapacitate) per unit time. 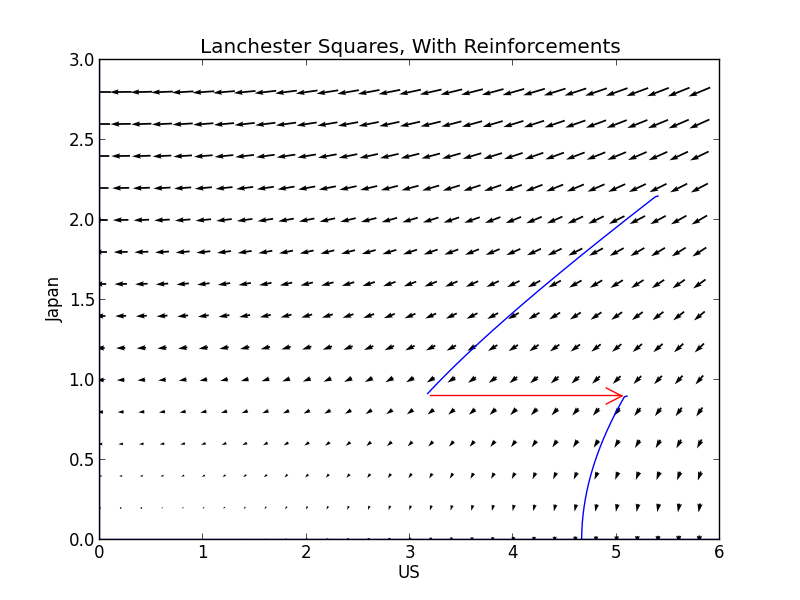 Likewise, Blue has x soldiers, each with offensive firepower β.
Lanchester’s square law calculates the number of soldiers lost on each side using the following pair of equations . Here, dy/dt represents the rate at which the number of Red soldiers is changing at a particular instant in time. A negative value indicates the loss of soldiers. Similarly, dx/dt represents the rate of change in the number of Blue soldiers. A less abstract example, discussed by Hughes-Hallett et al (p. 606), is the battle between US and Japanese forces at Iwo Jima. The authors conjecture that α=0.05 and β=0.01. They further assume that the US had 54,000 troops and 19,000 reinforcements (whom we will ignore for now), while the Japanese had 21,500 troops with zero reinforcements. These numbers roughly match the historical record. The battle starts at the initial values listed above and lasts for sixty time periods, ending in the complete annihilation of the Japanese troops (also close to reality). Note that the axes are scaled in units of 10,000 troops. The plots were created in Python with matplotlib, and the source code can be found here. What happens when we add the US reinforcements? I created a second scenario in which the 19,000 reserve troops are committed to the battle when the Japanese force dwindles to 9,000 troops (at about t=30). The addition of reinforcements is indicated by the red arrow in the plot below. As you can see, the battle ends more quickly (at t=50 instead of 60<t<65), with fewer US casualties overall (losses of 32,000 in the first scenario versus 27,000 in the second). In actuality, Wikipedia reports, “Of the 22,060 Japanese soldiers entrenched on the island, 21,844 died either from fighting or by ritual suicide. Only 216 were captured during the battle. According to the official Navy Department Library website, ‘The 36-day (Iwo Jima) assault resulted in more than 26,000 American casualties, including 6,800 dead. '” By changing the time period at which reinforcements are added, this result could be closely approximated by Lanchester’s model. This is an admirably simple model, which seems to approximately describe actual events when tested. So what is the problem? The biggest issue, which Martin Braun mentions in his discussion of Lanchester’s work, is that it is almost impossible to determine the values of α and β before the battle actually occurs. There has been work on estimating those parameters as Markov transition probabilities, but for the most part contemporary scholars of conflict do not analyze individual battles. One important exception is Stephen Biddle’s work, linked below. [Peruvian President] Humala said the capture of Shining Path leader Freddy Arenas this week signalled the end of the Maoist guerrillas in the Alto Huallaga Valley. The Shining Path posed a major challenge to the Peruvian state in the 1980s but has since dwindled. 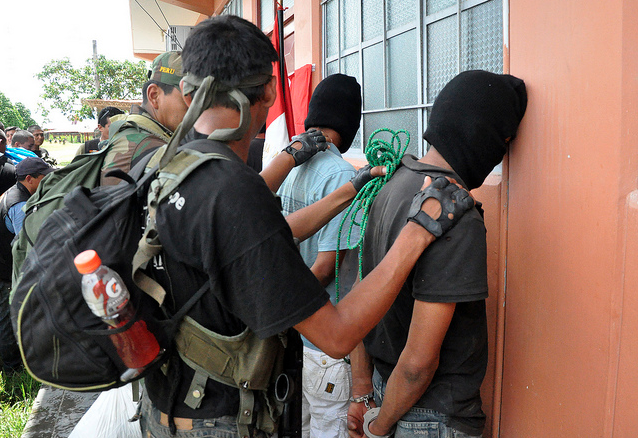 Small gangs remain in the south-east, where they run much of the drug trade. The announcement came a day after Peruvian security forces made public the arrest of Mr Arenas in the Alto Huallaga Valley…. The security forces said Mr Arenas, better known as Braulio, took over the leadership of the Shining Path in the region after the arrests earlier this year of previous leaders Comrade Artemio and Walter Diaz. “Not only have we caught the last of the historic leaders, Artemio, but also those leaders who took over from him, totally defeating them,” President Humala told TV Peru. In December, 1994, the mayor of Ayacucho (the city where Sendero was founded) said “without reservation that the Shining Path no longer exists in the place where it was born,” according to the New York Times. Maybe this time the politicians are right. BALL IS 46, STOCKY, SHORT, and bearded, with glasses and reddish-brown hair, which he used to wear in a ponytail. His manner is mostly endearing geek. But he is also an evangelist, a true believer in the need to get history right, to tell the truth about suffering and death. Like all evangelists, he can be impatient with people who do not share his priorities; his difficulty suffering fools (a large group, apparently) does not always help his cause…. He first applied statistics to human rights in 1991 in El Salvador. The U.N. Commission on the Truth for El Salvador arose at an auspicious moment — the new practice of collecting comprehensive information about human rights abuses coincided with advances in computing that allowed people with ordinary personal computers to organize and use the data. Statisticians had long done work on human rights — people like William Seltzer, the former head of statistics for the United Nations, and Herb Spirer, a professor and mentor to almost everyone in the field today, had helped organizations choose the right unit of analysis, developed ways to rank countries on various indices, and figured out how to measure compliance with international treaties. But the problem of counting and classifying mass testimony was new. Ball, working for a Salvadoran human rights group, had started producing statistical summaries of the data the group had collected. The truth commission took notice and ended up using Ball’s model. One of its analyses plotted killings by time and military unit. Killings could then be compared with a list of commanders, making it possible to identify the military officers responsible for the most brutality. That’s an excerpt Foreign Policy’s “The Body Counter,” and it’s worth reading in full, especially if you enjoyed this post.